Are you suffering from neck pain and related disturbances? Then maybe its time to buyMemory Foam to avoid neck pain. The product is really good and the form is really soft. The memory form is filled in it and you can feel it inside. The pillow has a dimension Appx - 29cm x 28 cm x 9 cm (LxBxH). It is not inflatable and do not have a Velcro strap. When I bought the product, it was available in blue and brown color, and now the only brown color one is left. You can use it for travelling to and from the office. It is way too cheap compared to other sellers on Amazon. Pillow keeps your neck warmer in cold climate. In first use, it may feel little uncomfortable. 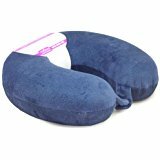 I bought Memory Foam Neck Travel Pillow on Amazon for 499 Rs, however the price has increased to INR 599 now. You can wait for lightning deals to buy this product. I used it for sometime and neck pain has reduced slightly. The pillow will reduce pressure on the neck muscles and hence may reduce muscle strength also. So it would be better to consult a doctor or orthopedic before using it regularly.